The Sikh Gurdwara of San Jose is a beautiful, serene temple where all are welcome regardless of religious or cultural backgrounds. Langar, a free kitchen, is open everyday to visitors of the Gurdwara. The food is cooked fresh daily and consists of simple yet tasty cuisines. Our popular Gurmat Camps take place twice a year in the summer and winter breaks. Keep visiting our website for up-to-date information. 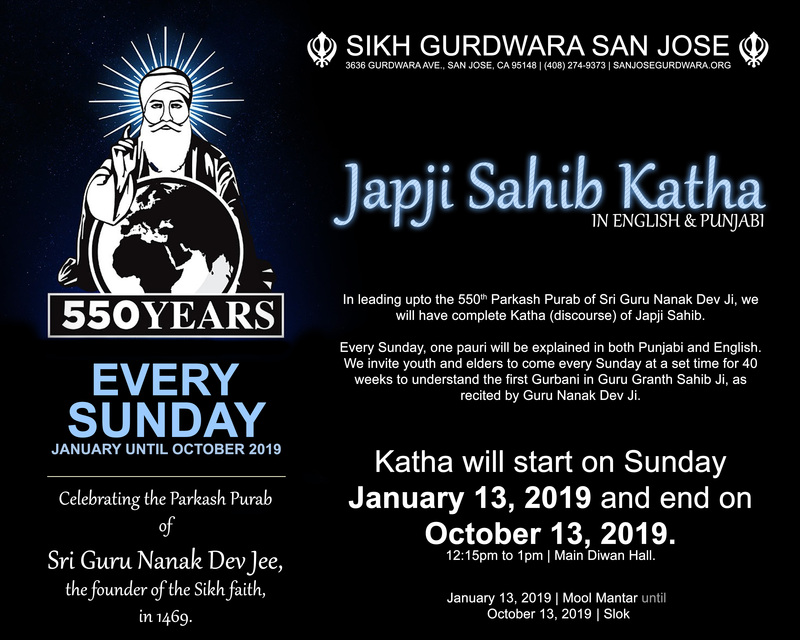 We have Japji Sahib katha every Sunday in Punjabi & English to celebrate 550 years Parkash Purab of Guru Nanak. Nestled in the foothills of the verdant and lush Evergreen Valley of San Jose, California is one of the Greater San Francisco Bay Area's well-known spiritual and tourist destinations. The Gurdwara is open to Sikhs and non-Sikhs everyday and offers a daily prayer and free-kitchen services, as well as a weekly school for youth to study the Sikh faith and music. One of the largest Gurdwaras outside of India, the Gurdwara was founded by the local Sikh community and is run on donations. This 2019, we are celebrating 550 years since Guru Nanak Dev Jee stepped into this world. We have special events throughout the year. One of the largest Sikh Gurdwara's outside of India. The Gurdwara is environmentally-friendly, relying on solar power.